A retirement full of holidays in far off locations seems like an ideal prospect and senior citizens who do have the time to spare will have far more options than the twice a year family holiday maker. But for some senior citizens, retirement may be a time when financial budgeting is an issue, and as such, taking full advantage of discounts on holidays and trips should be looked into when considering a holiday. One of the great things about retirement is the amount of spare time you will have. Unlike most families who fit their holidays around work you can go any time of the year, and this is where cheaper holidays come into play. If you can spare the time then you can book three or four months in Spain or Greece for around £400 including flights, accommodation and some meals. Off season prices are available at much lower rates than those during the peak summer months. Although these discounts are available to everyone, it is mainly retired people who can take advantage of them. The off season months are during winter and early spring, and in places such as Spain, Corsica and Greece there will still be enough sunshine to easily gain a tan as you play some golf. At less than a £100 per month, and with the favourable exchange rates to the pound in many European countries, you will probably save a whole lot more than staying in Britain. Many travel companies now have packages specifically designed for senior citizens and retired people. These companies do have discounts on holidays for retired people that may be dependant on the time of year you go. There are also good discounts to be had on group bookings if a there is a party of people considering hiring a villa or larger apartments. Also research your options when it comes to travel companies; tour operators such as SAGA are specifically designed for people over 50. They are well aware of the issues faced by the older traveller and have some very good discounts on holidays. Everyone knows that booking well in advance can bring some great discounts and lower rates when it comes to booking holidays. But booking at the last minute is also a good way to achieve very low cost holidays, and not necessarily off peak ones. One of the best ways of booking last minute holidays is via internet. There are travel companies that specialise in booking holidays over the net. The advantage of these holidays is that everything is booked via your computer and can be booked as late as the night before you are travelling, giving a wide scope for bargain holidays. 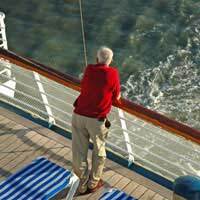 Cruises are very popular with older travellers; the chance to drift from port to port as you relax on deck with all the amenities at your fingertips. Cruises can range from the cheap where you travel from only one destination to another, or they can be luxury multi destinations that stretch over a few weeks. You can book all inclusive cruises where all food, drink and entertainment is included in the price and all you need to do is relax and watch the world go by. Do your research when you are considering a cruise and find out exactly what you are getting for your money. There are many excellent cruise operators that give good value for money and good discounts for older travellers. Single supplements have long been a source of irritation to many single travellers. The fact is that over 50% of older people are single and yet many holiday operators will still charge extra for the single traveller; as much as 50% to 100% extra. Many travellers simply grin and bear these single supplements and many will simply choose not to go on holiday. There are a few ways you can beat the single supplement charge and they are basically as the tips above; book in off season periods, and book last minute. There are also tour operators that run singles holidays for the older traveller, and details and brochures for these companies can be found at your local travel agents. You can also try negotiating with your travel operator regarding the single supplement and some will be very helpful, although others not so. Holiday groups for older people such as SAGA are well aware of the single supplement fee and do provide holidays specifically for the older, single traveller. Travelling the world and seeing new destinations is a joy for all, but getting a great holiday at an excellent price means you can afford to splash out more than once a year. Retirement is something you have worked towards all of your life, and having an affordable holiday can be achieved if you put in the research time.